According to the CPI, the unexpected jump in inflation could be mainly attributed to the huge increases in the costs of transportation, housing rent, and financial services. Due to the summer holidays, airfares rose by a whopping 9.8% while housing rent ticked up by 0.4%. Inflation isn’t necessarily a bad thing, but if the rate is higher than wage growth, then there’s a problem. Let’s say an apple today costs 1 GBP. 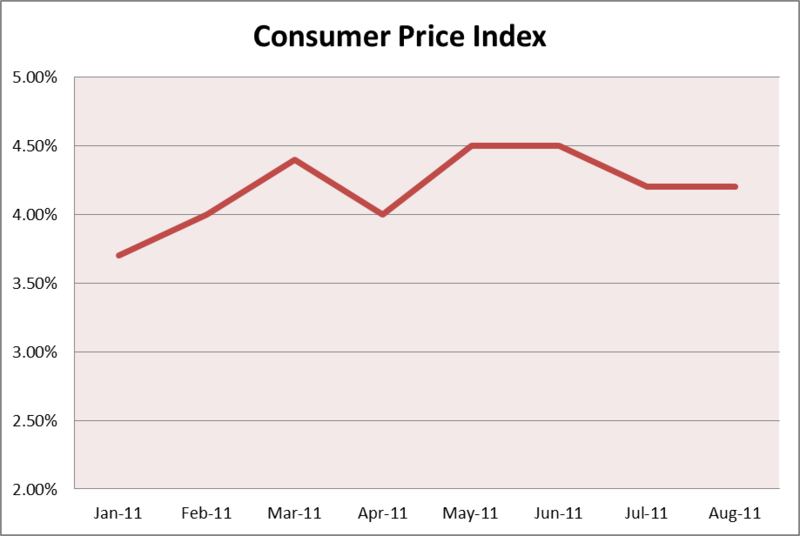 Next month, due to inflation, the price of an apple rises 5%. The apple is now worth 1.05 GBP. During the same amount of time, because you were such a good employee, you receive a raise from your kind boss. From 10,000 pounds, he increased your pay to 10,400 GBP for a 4% gain. The salary raise was a good thing, but since it didn’t keep up with inflation, you actually still became poorer. Using complex mathematics (not really), you can only buy 9905 apples now versus the 10,000 apples last month. Looking ahead, many economists, including King himself, speculate that inflation could spike to as high as 5% over the next few months as energy bills rise. Normally, central banks try to limit rapid inflation by raising interest rates. However, this appears to be out of the question for the BOE. The BOE hinted early last week that with all the gloom surrounding the U.K. economy, the bank will most likely keep rates at current levels for another year and a half. In addition, policy makers believe that this rise in inflation is merely temporary, and that it will temper down below the bank’s mandated 2% target next year. Moreover, the MPC hawks have seen their numbers dwindle from two to nil. Yesterday’s MPC minutes showed that the last two remaining hawks, Martin Weale and Spencer Dale, changed sides and voted for no change. With rates staying at current levels and with the prospects of the U.K. economy not looking to bright, it’s hard for me to see the pound making a sustained rally on the charts. 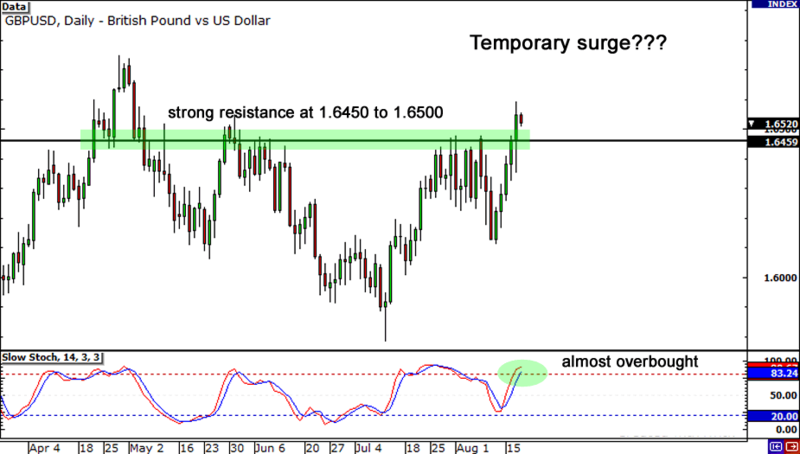 Looking at the daily chart of GBP/USD, we can see that the pair has broken out of the resistance at 1.6450 to 1.6500 region. While this may be interpreted as bullish, it could also be a fake break, given U.K.’s poor fundamental background. With the Stochastics about to hit overbought conditions, there may be some bearish traders out there who are getting ready to duke it out with the pound bulls to re-establish their short pound positions. If you’re part of the bear camp, keep a close eye on the pair for a possible reversal play!